The intent of this challenge map is to survive a bunch of tsunamis, followed by achieving a really high population density on some unforgivably small islands. Fortunately, you can kind of cheese the first mechanic, and really cheese the second one! You get hammered with a series of increasingly big tsunamis, starting with a 2, running up to a 10, and then a few smaller waves after that. The size ten tsunami will easily flatten your entire map and can bring your population to zero, and the frequency of them can bankrupt you. So, let's cheese it! Quickly build up the three islands in a row in your starting tile. Stick to the barebones, definitely don't do high schools, and switch to the water-turbine as soon as it's available (the tsunami doesn't destroy the water turbines for some reason, though it will repeatedly flatten other power structures). A few thousand people and some basic services will get you a $5,000 a week profit in your budget. Once you hit that amount, you're set. Don't build up the town more than that. The game automatically demands growth in residential zones while your town is still small. It's how you build a town from nothing, and this initial artificial demand goes away after your city gets too big. As each tidal wave comes through and flattens your neighborhoods (turn the budget on your already limited services down while this is happening) you just bulldoze them and new people move in right behind the wave. Since each wave is going to wipe out most (or all) of your current citizens, you don't need any high schools. You might want toss an elementary school down on each island, as sims almost instantly move into emptry residential zoning next to elementary schools. While each wave cuts through the city, turn all your budgets down to half, or just turn the individual buildings off entirely. Assuming your city profits 5k a week, people move in quickly enough after each wave to keep you well above bankruptcy. On the larger waves, make sure you slow the game and pause it so you can bulldoze just behind each wave as it comes through. Because the demand for residential is artificially high, you can have half the neighborhood moving into the first island just as the wave crashes into the third. I built a disaster response building on the third island (the one that isn't in the chain of three) and surrounded it with flood walls. It survived most of the waves and allowed me to rebuild my elementary schools and essential service buildings for cheap. You probably can't afford to keep rebuilding the recycling center/landfill. Warning: Building a disaster response building will cause the game to try to "search for survivors" in every building, which isn't what you want. You only want the disaster response building to send trucks out to let you rebuild your service buildings for cheap. Bulldoze every flattened, non-service residential/commercial/industrial building as the waves come through so that your disaster response trucks will go to your service buildings instead. You might also want to make the center island a "VIP" district with its own shelter and small warning antenna. This will guarantee that you'll avoid dropping to zero population, though people move in so fast that it probably isn't necessary. Just run it at high speed between waves while your bank account builds up, and then slow it down or pause it while the waves tear through so you can do all your bulldozing. 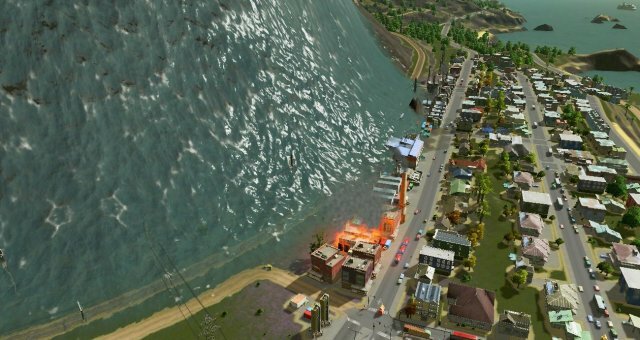 After you've had eight tsunamis (and some earthquakes) the game never has another serious natural disaster, so there's no need to maintain any shelters. Antennaes are a cheap happiness boost in the mid to late game though, so you might as well toss those down. Thus, you should run the game, on high speed if necessary, until the tsunami portion is over. Once those are behind you, switch to part two. If you've done any reading online you've probably noticed a lot of people living the nightmare of trying to get 250,000 people squished into the map's tiny islands. It's certainly possible to scoop out the oceans and make all of the islands a bit bigger, and with some luck, squish everyone in. But that's tedious and you don't want to end up with 230,000 people and no more space (or maybe that's what happened to you and that's how you arrived at this guide). Identify a quarter of a tile that you can constantly pull dirt in and out of. This will constantly be making little tidal waves, so if you have development on any nearby islands, toss up some flood walls. Scoop some dirt out of the ocean with the big brush. Now switch to the tiny brush, and switch to the "level terrain" tool. Right click an existing island to set the terrain height. Then using the left mouse button, draw the outline of your next district. You need a completely solid outline above sea level for this to work. Build ten or twenty water pumps facing inside your newly built bathtub. Make sure the game is on high speed. Go do other things for fifteen minutes. Name some streets. After 15-20 minutes the water level will drop and you'll be left with a bathtub-style district in the middle of the ocean. You can repeat this process and, if you really wanted, drain the entire workable map, though it's more fun and more pretty to use a combination of islands and below-sea-level bathtub districts. It might *seem* like it would be faster to raise up a mountain, then turn the center into an empty crater, and push the soil outward, but it's actually a huge pain and much easier to just draw a tiny line of just-above-sea-level dirt as the outline of your future bathtub district and drain it. It doesn't take long, and if you're impatient, you can always just build more water pumps. You should also leave a water pump or two running in each bathtub at all times, and use the pumping service, as your constant landscaping, and the nature of the bathtubs, means you'll acidentally flood them occasionally. It's also a good idea to draw the bathtub edges a touch higher and line them with floodwalls if you'll be doing landscaping nearby. Hopefully you don't depend on tunnels much, because tunnels won't run under the lip of the terraformed bathtub (they can only go so far underground, and your bathtub lip is too high for them). So you'll need to use bridges. 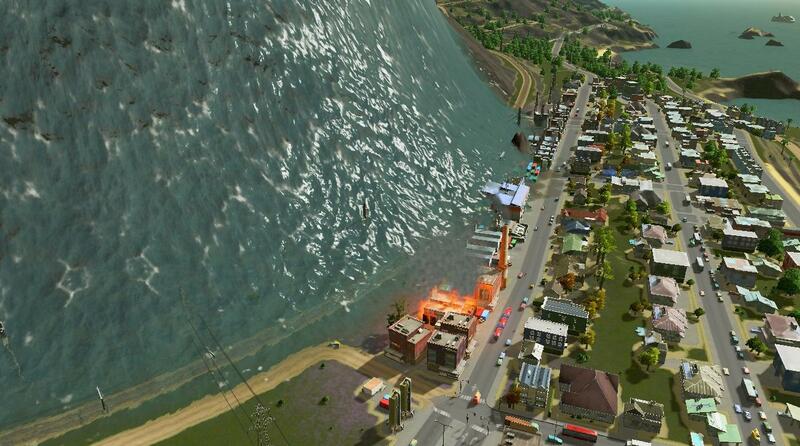 Be very careful about sims building on the edge of your bathtub (especially if you make zoneable areas around the lip) as new buildings will auto-terraform an area, potentially bringing the lip below sea level, and drowning an entire district while you're not paying attention. Unlike expanding the islands, with the Dutch method you never run out of soil. Eliminating just one island is enough soil to bathtub your way to 250k, as is scooping out half a tile of ocean at the edge of the map. The scenario gives you much earlier access than usual to milestones for some reasons, which means you can build the Eden Project very early on, if you have access to it. If you do, build it as soon as it's available, so you don't end up with a death wave problem when you plop it down at 150k population.